A very earthy look for Wednesday! The skirt used to belong to my Mom, as did the crochet top, and as usual, I had to satisfy my need for combining prints and textures. The outfit felt like it needed a little extra so I threw on the fur vest! And to top it all off, I added my sun hat from H&M. Either my head is small, or the hat is too big, because it fits on the looser side. Regardless, I think it's still a great piece to own, especially when you want to shield your eyes from the sun but don't feel like wearing sunglasses! Hope all of you had a wonderful day and see you all tomorrow! That outfit is amating!! I totally love your blog! You're so inspiring!! 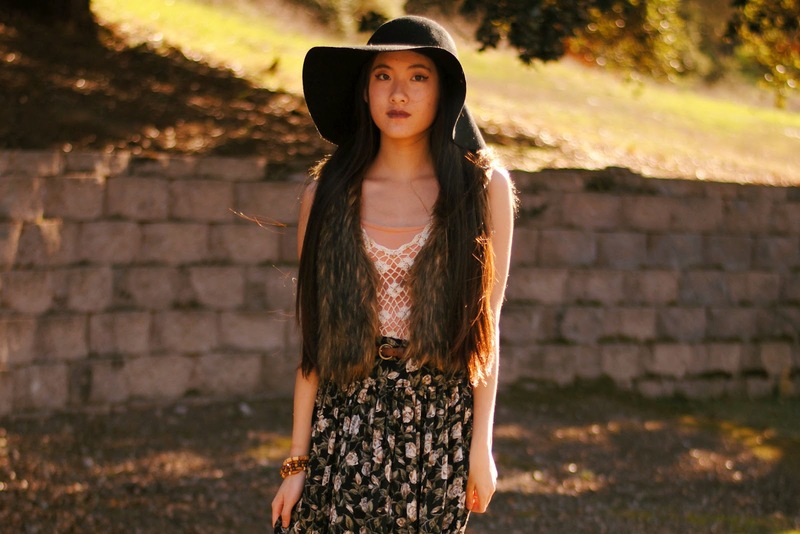 I love everything about this outfit and the boho feel! Great blog :) New follower! The skirt is beautiful! Love it!